QMSCAPA has a built-in feature to allow a user to edit the field prompts for support of alternate languages and vocabulary. • Buttons and so on can be translated. 2) Press the Ctrl+F10 Key to open the Translation Window. 1)Column 1 shows the QMSCAPA standard text. 2)Column 2 is an edit in place field for the Global Translation. 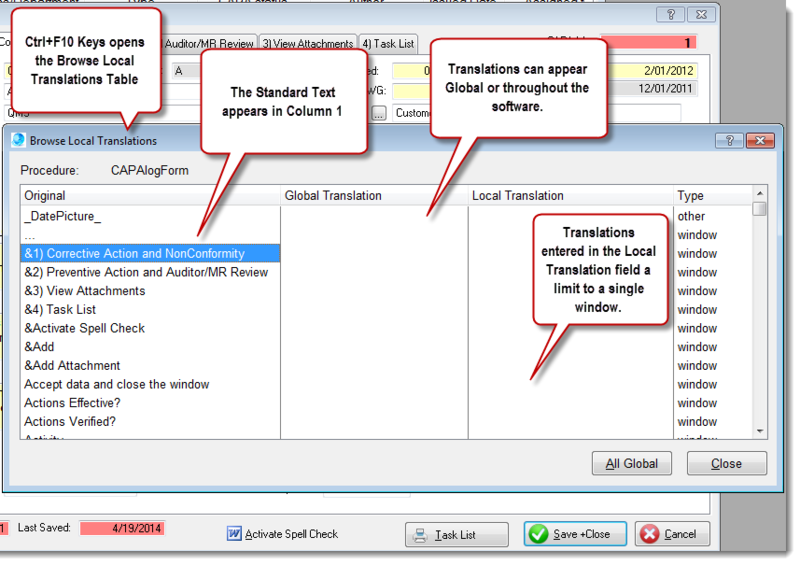 Translations entered into the Global Translation column will appear in every window with that uses the same standard text. 3)Column 3 is an edit in place field for the Local Translation. Translations entered into the Local Translation column will appear only in the current active window. 4)To add a translation click into the appropriate column field and type directly into the space. Saving is automatic once another field is selected or the Close button is clicked. 5)The Type column confirms the text phrase is related to a Menu, Window or Other control.